Abraham Bosse (c. 1602-1604 – 14 February 1676) was a French artist, mainly as a printmaker in etching, but also in watercolour. He was born to Huguenot (Calvinist) parents in Tours, France, where his father had moved from Germany. His father was a tailor, and Bosse's work always depicted clothes in loving detail. He married Catherine Sarrabat at Tours in 1632. He remained a Huguenot, dying before the Revocation of the Edict of Nantes, but was happy to illustrate religious subjects to Catholic taste. Roughly 1600 etchings are attributed to him, with subjects including: daily life, religion, literature, history fashion, technology, and science. Most of his output was illustrations for books, but many were also sold separately. His style grows from Dutch and Flemish art, but is given a strongly French flavour. Many of his images give informative detail about middle and upper-class daily life in the period, although they must be treated with care as historical evidence. His combination of very carefully depicted grand interiors with relatively trivial domestic subjects was original and highly influential on French art, and also abroad — William Hogarth's engravings are, among other things, a parody of the style. Most of his images are perhaps best regarded as illustrations rather than art. He was apprenticed in Paris about 1620 to the Antwerp-born engraver Melchior Tavernier (1564–1641), who was also an important publisher. His first etchings date to 1622, and are influenced by Jacques Bellange. Following a meeting in Paris about 1630, he became a follower of Jacques Callot, whose technical innovations in etching he popularised in a famous and much translated Manual of Etching(1645), the first to be published. He took Callot's highly detailed small images to a larger size, and a wider range of subject matter. Unlike Callot, his declared aim, in which he largely succeeded, was to make etchings look like engravings, to which end he sacrificed willingly the freedom of the etched line, whilst certainly exploiting to the full the speed of the technique. Like most etchers, he frequently used engraving on a plate in addition to etching, but produced no pure engravings. In 1641, he began to attend classes given by the architect Girard Desargues (1591–1661) on perspective and other technical aspects of depiction. Bosse not only adopted these methods but also published a series of works between 1643–1653 explaining and promoting them. In 1648, when Cardinal Mazarin established the Académie royale de peinture et de sculpture, Bosse was made a founding member. However his publicising of Desargues' methods embroiled him in a controversy with Charles Le Brun and his followers who had different methods, and also a belief that "genius" rather than technical method should be the guide in creating artworks. In 1661 Bosse was forced to withdraw from the Academy; he established his own school as an alternative. Traité des manières de graver en taille douce sur l'airin par le moyen des eaux-fortes... (1645) The "Manual of Etching". 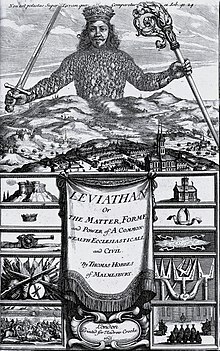 The famous frontispiece for Leviathan by Thomas Hobbes (1651) was created with input from Hobbes. Jean-Claude Vuillemin, “Abraham Bosse,” in L. Foisneau, ed., Dictionary of Seventeenth-Century French Philosophers, 2 vols. London and New York: Thoemmes Continuum, 2008. I. pp. 176–79. GUERRIAUD, M., Abraham Bosse et la gravure du doyen. Revue d’Histoire de la Pharmacie, 2013(378/379): p. 289-301. ^ Guerriaud, Mathieu (2013-09-01). "[Abraham Bosse and the dean's engraving] Abraham Bosse et La gravure du Doyen". Revue d'histoire de la pharmacie. LXI (378/379). ISSN 0035-2349. Wikimedia Commons has media related to Abraham Bosse.